This may be the most detailed review of the Moov Now on the web. Reviewed by Tony, who actually bought this device himself and tested it for you, plus a video review by our friend Jim. How exactly will the “Moov Now” fitness tracker and live audio coach help us? MOOV NOW talks you through your other workouts with real-time audio coaching for running, cycling, cardio boxing, body weight (Moov 7 Minute+) and the most advanced swim tracking available. A wearable fitness coach that actively monitors your tendencies, advises you on how to get the most from your workout, tracks your progress, and motivates you to achieve your fitness goals. Who should get the Moov Now? Where to get Moov Now? To sum it up for you, the Moov Now is a multi-sport fitness tracker and fitness coach, developed by Moov, that you can wear on your wrist or ankle. Multi-sport means the activity tracker can be used for cycling, swimming, running, walking, boxing and even circuit training. Because of its long battery life (6 months) you can wear it 24/7 without any need for charging. Thanks to the Moov Now app, the activity tracker comes with a digital and smart audio coach that will help you to improve your daily activity. Check out the packaging below. Personally I really like the design of the packaging. Complete tech specs for data nerds. Skip this section and continue below with the Moov Now review if you are not interested in the technical details. The Moov Now watch is basically a flat rounded device that you put into a soft black silicon strap. See image below. The round device is called “core“. The core is where the electronics sits inside. Thanks to the designers the housing is water- and dust-proof. For your individual style the Moov Now core is available at your favorite store in 4 different colors: So called “Aqua Blue”, “Blizzard White”, “Fusion Red” and “Stealth Black”. As you can see, my decision was “Blizzard White”. Additionally included in your box are two different strap sizes: A large one for your ankle and a smaller one for your wrist. Wrap the silicon strap around your wrist or ankle, close the Aluminium clasp, sync the Moov with your smartphone and you are ready to go! A Moov Now fitness band only makes sense when you pair it with your smartphone. I order to get started you should download the Moov Now app at the iTunes App Store or at the Android Play store. If you start a coaching workout there is a smooth voice which tells you your current performance status every mile you run or cycle. Moreover listening to your favorite music during tracking sessions is also easy. Because the app will smoothly turn the volume down so that you will hear your workout status update although listening to music. Which activity will the Moov sensor track? The Moov Now sensor is currently able to track the following 7 activities. Additionally Moov’s vision is to release much more sport programs in the future. When I created this Moov Now review (August 2016) (updated May 2017), there were 5 different running coaches available. Some of these modes will work on treadmills by the way. Only for speed endurance mode you need to have GPS enabled, for the other other modes its optional. For example in the speed endurance coaching mode the coach will give you a target pace. Thus your trainer will help you to improve your pace and distance. Let’s say you have a target pace of 5 minutes per kilometer. The coach will tell you to speed up or down, depending on how good you do. Additionally the smart coach remembers how good you did the last time and will increase your difficulty level over time. However, you always can increase or decrease your current difficulty level by swiping on the difficulty screen. Both screenshots above shall give you an idea of how the running mode looks like. Moreover there is also a google map that shows your running trail. Additionally there is a list that splits your run into different sections to show how you did for each section. Very likely you are good in the beginning but perform worse as soon as you get tired. Moreover, graphs of elevation, impact, range of motion cadence and pace over display your performance over the running distance. I tried both, the outdoor cycling coach and the indoor cycling coach. To use the outdoor tracking coach you will need a phone with GPS activated. Given that, the outdoor tracking coach will give you continuous status updates. In detail, cycling cadence, average speed, cycling duration and the “Moov Power” indicator will be mentioned each mile you ride. Take a look at the app during your ride and see a lot of data that is being visualized: Your route on google maps, elevation, calories burned, average speed and much more. In addition there is a lot more data available than shown in the screenshots above. Indoor cycling of course will provide less data thant outdoor cycling because no distance is being measured. Therfore the smart coach voice will continuously tell you your current cycling cadence and the elapsed time. For swim tracking it is not required that you have your phone with you. Just start the swim coach before your workout. After that the Moov Now smartband will record your training session and store up to 120 minutes of swim data. Because the Moov is 100% waterproof (up to 3 meters / 10 feet) you don’t have to be afraid to damage the sensor when it gets wet. After your swim workout you have to sync the data to your smartphone. See below some data that I gathered during my swim tracking tryouts. Breast stroke / freestyle swimming was recognized automatically. Moov’s app will request you to enter the pool length so that it is able to calculate your performance indicators. Thus – in my opinion – Moov Now is not ideally suited for open water swimming because you will very likely not have a distance to enter in the app. During the 7 minute cardio workout your workout coach will tell you different workouts and will register your performance. More details to follow. Moreover cardio boxing is also optimized for use with two Moovs (optionally). This means you can wear one Moov Now on each wrist. The coach will tell you how to moove your feet. Take a look at the screen to take action in the right moments. There are several difficulty levels, with level speed and number of action points will increase. While many other wearables do track steps, this one doesn’t. Instead it tracks so called “active minutes“. But what are active minutes? It is an activity indicator that is much more sophisticated than steps. Because the intensity and type of your activity are being calculated together. Moov Now tracks your active minutes during the whole day. I guess you agree that it does not make sense to count steps while you are swimming or cycling. Thus the performance indicator “active minutes” seems to make sense for me. Sleep tracking with the Moov Now is easy. You don’t have to tell the device that you are going to sleep or that you get up because it will detect it automatically. Sleep will divided into light sleep and restorative sleep. A restorative sleep of at least 50% is recommended. You can set your difficulty and the walk tracking coach will you your interval and cadence. Add all your friends that also do have a Moov Now to your list and compete with them. The competition gives some extra motivation. Moreover after every week there is a top list that shows who did best in the past week. Do your work good and you will earn badges if you reach certain goals. Active minutes and sleep tracking data is automatically synced every 45 minutes. However to manually sync your data just open the Moov app and press your Moov. Consequently everything will be up to date in seconds. In case your phone is not near you it is not a problem. Therefore active minutes data and sleep tracking data will be stored in the core up to 30 days. Heart rate monitoring with the Moov Now? For heart rate monitoring (HRM) Moov offers 3rd party integration. This is possible for HRM straps that are equipped with Bluetooth 4.0. According to Moov’s knowledgebase Moov recommends Polar chest heart rate monitors for ideal compatibility with the Moov app. Of course you will need a modern smartphone. For best training experience I recommend you to get additional headphones to hear the coaching instructions. Having wireless Bluetooth headphones like the Jaybird X2 that we reviewed makes things a lot easier because you can put your phone on the shelf during indoor workouts. To clean the Moov Now just rinse it with clean water. Moovs wearable fitness coach is designed for you, if you would like to make your whole day more active. In particular the fitness band will help you to increase your activity and get healthier over time. If you are looking for a device with a good price/performance ratio that provides a long battery life you should consider the Moov now. In these cases Moov now is your perfect companion to track your everyday activity. On the downside there is really missing a data export function to create own graphs and get a deeper look into your data. Because of that, data lovers should consider more expensive wearables that might also include additional features like heart rate monitoring (although Moov Now does support third party HRM) or integrated GPS. For more advanced features check out my posts on GPS smartwatches for runners, trackers for open water swimming, and triathlon watches. The following section will give you an overview on the most important advantages and disadvantages contained in this Moov Now review. Moov Now automatically tracks your activity and workout intensity. No need to tell your device that you are going to sleep now – it will detect it itself. As a result of the soft silicon band and the very low weight Moov Now is really comfortable to wear. 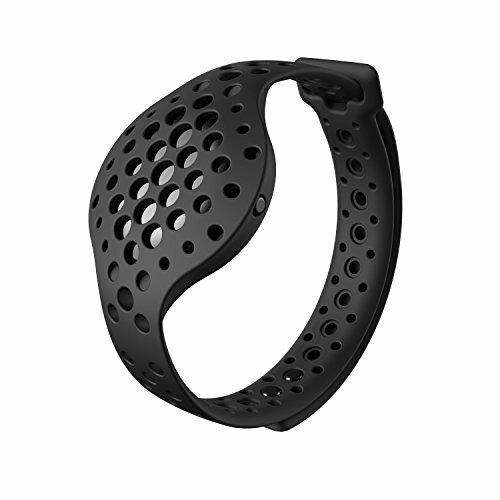 Thanks to the many holes of the silicon band you can easily adjust your Moov to fit your wrist or ankle. Because the Moov Now core is so energy efficient there is no need to recharge your device every other day. In fact it will last as long as 6 months until you will have to replace your battery. Obviously Moov’s smart audio coach motivates you to increase your workout level and to improve your fitness. No need for a drill instructor anymore, the smart coach app will do the trick. Moreover competing with your friends is fun. Being the first on your weekly leaderboard will make you proud. Compared to those expensive smart watches currently on the market the Moov now has a very competitive price. Currently seems not to be possible to export data for deeper data analysis. The design of the Moov Now is certainly a matter of taste. Not everybody does like the look of the band. The Moov tracker was designed to consume as little power as possible. Thus the engineers did not include a power consuming display but only a little LED. As a consequence, Moov Now has to be operated via your smartphone. Of course Moov Now will track your normal activity all the time. Personally I would prefer it to be able to get a deeper insight into the daily statistics. I was not able to zoom into the time charts displayed at the Moov Now app. Some people were reporting that they lost their core because it slipped out of the band too easily. Luckily Moov released a new 2016 edition of the Moov Now which features a new more durable and secure band. Another Moov Now review poster stated here that the robotic voice is really annoying. This may be right. But the voice output can be improved dramatically if you download a high definition TTS (Text To Speech) language file to your phone. The main advantage of the Moov Now is to show you your daily level of activity. No matter what kind of sport you do, with its multiple sensors the Moov Now will capture your activity. Furthermore this light wearable is comfortable to wear, has long battery life and keeps you really motivated. Moov Now is ideal if you are a triathlete and looking for a wearable that will track your cycle, swim and run training. In contrast the main disadvantages are its missing display, design may be not your favorite look and I am missing the option to export and or zoom into the daily data but maybe a future update will bring this features. Overall the price/performance ratio is pretty good. Up to 6 months battery life and a waterproof! Band is lightweight and breathable. Wear it on your wrist or ankle or wear two.